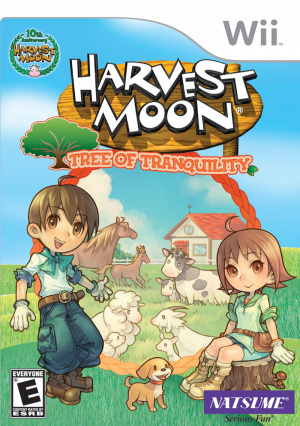 Tree of Tranquility is the first game in the main Harvest Moon series designed exclusively for Wii, following 2007’s disastrous Gamecube port Magical Melody. It’s been available in the US for over a year, but now it’s finally available in PAL territories it’s time to see how it measures up. 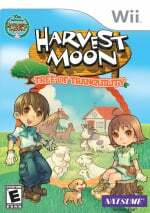 You’ll either be relieved or disappointed to hear that Tree of Tranquility deviates very little from the classic Harvest Moon template. You plough fields, grow crops, raise animals and find a wife or husband, as you can now choose to play as a girl without buying a later rerelease. The overall aim of the game is to restore Waffle Island’s Mother Tree, bringing peace and prosperity back to the island’s inhabitants, which will take you a couple of years of game time with everything else going on too. Although the majority of the gameplay hasn’t changed since the series’ first appearance back on the SNES, this Wii update does include some motion-sensitive controls, although to be honest you’re much better off using a Classic Controller. On the whole the game controls well, with some slight variations on the established template – holding down L on the Classic Controller locks you in one direction and enables you to walk around one square at a time, which comes in very useful for tilling and watering before your tools level up. The camera control is a big letdown, though – instead of the character-following camera of the Gamecube’s A Wonderful Life, Tree of Tranquility sticks rigidly to a distant view that can only be panned around, with no zoom available. This makes it difficult to navigate towns and take in the surrounding areas, and although it prevents clipping and glitching issues it does make you feel detached from the “action”. Life on Waffle Island is slow at first, as is par for the course, but Tree of Tranquility slows things to a snail’s pace by not even giving you a farm for the first few hours, asking you to work on neighbouring Soufflé farm to learn the basics of picking weeds, watering plants and harvesting crops. Even by Harvest Moon standards it’s a boring start, and even after you gain your farm you’re still missing many of the necessary tools and the funds to pay for seeds. Once you do get your farm you can choose its location in one of three plots, although later you can buy up the remaining plots to grow more crops. There are other few additions to the standard HM fare too: if you’re stuck for money you can work part-time at one of the local shops or farms, a simple matter of turning up and saying “I want to work part-time”, making it easier to boost your finances at first. There’s still a range of festivals, each of which comes with a minigame to beat that all vary in quality, and you’ll need to replace your Classic Controller with a Nunchuk to play them. Irritatingly, not all minigames actually use the Nunchuk – the first bug-catching game is a simple point-and-swipe affair for Remote only, for example – but at least the games are all straightforward enough to convince others to play with you in the multiplayer Party Mode. They’re not amazing but they are a welcome break from the farming slog, and as they only appear at events they’re infrequent enough not to become a pain. There are new animals over previous entries too. The developers have come up with seemingly every standard farm animal imaginable, so now you can also keep silkworms and an ostrich, the former valuable for its silk and the latter just for transport. It’s understandable, really – farmers all over the world are famous for getting around on ostriches. The care of these animals is more traditional, following a daily routine of: feed, water, talk, cuddle, with a full complement of makers available to turn eggs into mayonnaise, wool into yarn and so on. Out of the barn and in the fields, you now grow different qualities of crops based on how well fertilised your fields are, although each square has its own base fertility rating, meaning you’ll need to plan your fields to maximise the yield. Seeds are now thrown in the six squares in front of you, and you’re also able to walk over plants with no detrimental effect to the crops, negating the need for odd field designs just to ensure each crop is watered. As the game progresses you acquire Power Berries to increase your lasting power and make farm chores easier to accomplish, but initially you have so little stamina clearing your field is a frustratingly difficult proposition, particularly considering how tiring it is simply lifting a weed out of the ground. Of course, it’s the series’ custom to make you work hard when starting your farm, but even the most hardened farmers will be put off by this initially glacial pace, made even longer by the loading times between each island district. 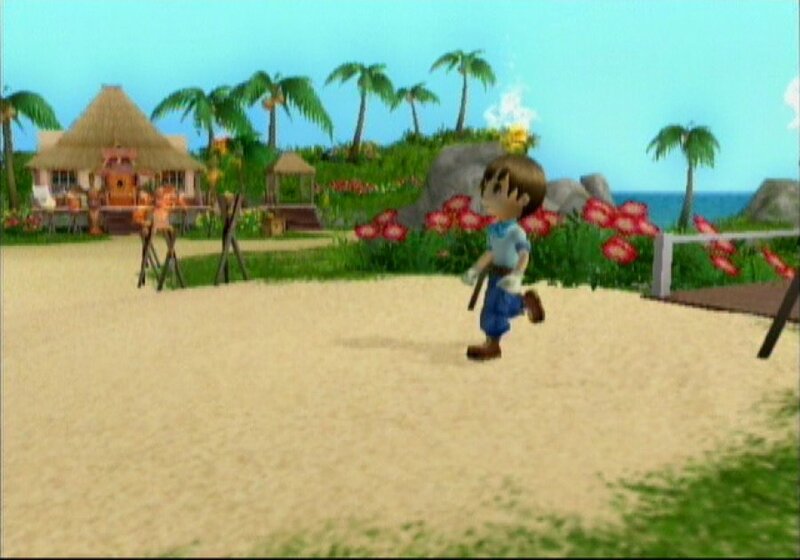 Waffle Island contains most of the standard HM features – caves, forests, beaches and shops – all divided into different areas marked out by signposts. Any time you move from one area to another you’re met with a loading screen for ten seconds or so, and considering there’s only three or four features in each area you spend just as much time loading as you do hoeing. Slowing the game down even further is the lack of 60Hz support, and the combination of the two detracts so much from the title it becomes more of a challenge to overlook its technical faults than create a successful farm and resurrect the Mother Tree. Other presentation issues hurt Tree of Tranquility too. The music is excellent – clear, varied and catchy, but the sound effects and voices are extremely tinny and sound like they were recorded with a yoghurt pot microphone. 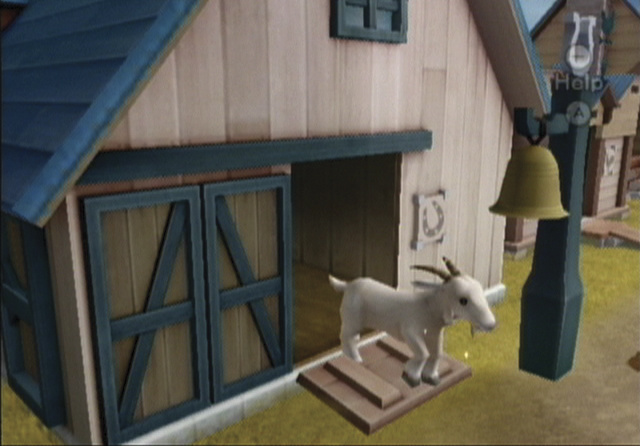 Graphically it isn’t too bad, with the characters’ spherical heads a matter of taste but certainly not offensive, although their animation leaves a lot to be desired: when two characters meet to talk, they freeze to the spot and pivot to face each other, and presents magically hop from one person to another. The game is riddled with issues like this that have admittedly existed in pretty much all the 3D games in the series, but with so many titles under their belt it’s a shame Marvelous haven’t made this a priority. The addictive gameplay of past titles is still there, but Tree of Tranquility simply repeats too many past mistakes, with little advantage taken of the Wii’s capabilities other than a few motion controls and minigames. The series needs a complete overhaul in the presentation stakes to complement its rock solid gameplay structure, but until we see that it’s worth keeping your money in your wallet. 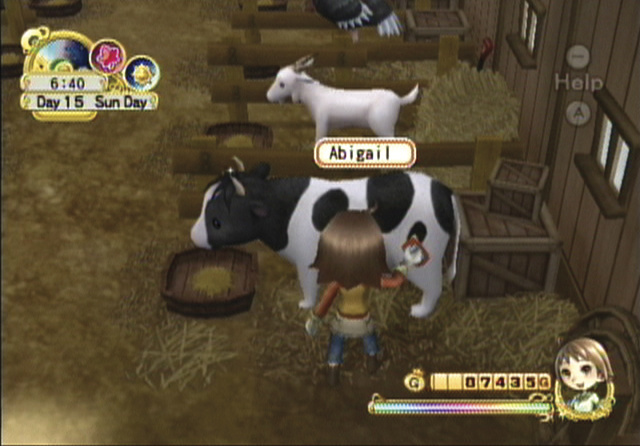 The GB harvest moon was cool ... all the wii versions seems to be boring as hell! Wait so how is this one different than Rune Factory? After a quick look, Run Factory looks better and probably play better. I am a huge Harvest Moon fan (going back to PSOne) but I will be getting Rune Factory though. The farming aspect of the game is obviously superior in Harvest Moon than in Rune Factory, but I also have to give the community and socializing aspects of HM the nod over Rune Factory. New villagers constantly move in, and they have routines that you can actually follow all throughout town. Characters have more personality as well. That being said Rune Factory is the better game. There's just a lot more to do, and even though it's not as in-depth it's still a lot of fun. Plus, visually Rune Factory is much better. Good review Prosody! This was one of those games that I was really excited about when I heard it was coming to the Wii. I was pretty disappointed when I saw such mediocre reviews for it shortly after it's release. 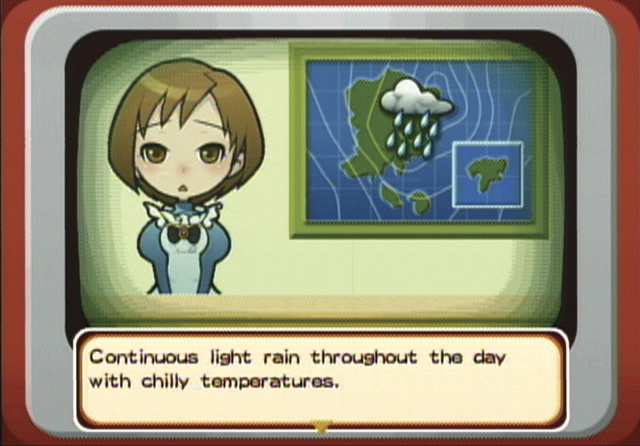 I'm glad that Rune Factory turned out to be a really good game so I could get my Harvest Moon fix. I just hope that Harvest Moon: Animal Parade on Wii turns out better than this one did. unless some serious change is imminent, this franchise needs to be trotted out to quiet corner of a field, put to sleep, and boiled down for glue. For the record though, there was a lot to like in this game. The entirely new cast had some pretty interesting characters. Plus they did a good job of integrating a story that had a goal that required you do more than just go about your daily tasks like in Magical Melody (which for some reason every review tends to ignore). I will agree that the pacing is a little slow, but not as bad a Wonderful Life. If you can put up with the load times, this really isn't a bad game. Robio - since I've reviewed it I've gone back and found myself liking it a bit more, and I'm aware that complaining about the pace in a HM game is like moaning about dungarees on Mario, but it was still a disappointment. You're also lucky in that your NTSC version runs nearly 20% faster than the PAL launch! I am looking forward to Rune Factory, though. I loved the DS one! They churn out these games far too regularly, if they slowed down enough to make significant changes between releases, instead of going all EA, then I might just return to the series. I strongly disagree with this review. As someone who has played every Harvest Moon game (except HM DS) I actually choose Tree of Tranquility as my favourite. I really enjoyed the tutorial at the beginning. I wasn't thinking "C'MON GET TO THE ACTION ALREADY", I was enjoying staying at a neighbour's house and working for Craig. The camera being fixed is only an issue for the first few days when you're learning the town layout. Your character has low stamina, which is true of all recent HM games, but there is a hot spring nearby. I actually enjoyed the pacing of the main story and the characters are wonderful. I like how they gradually move in. The bachelors and bachelorettes are great. I had a difficult time choosing. Rival couples can get married and the quickly have a child. Their children grow up and have distinct personalities. Farming gameplay is traditional and I have no complants. You can buy furniture and decorate your house however you like. There are lots of cooking recipes and it will be a challenge to complete them all. I think any Harvest Moon fan should give this game a try. It's better than HM64, in my opinion, and I know I'm not the only one who feels this way. Ok If you play Harvest Moon at first your like "This is so boring." Then if you play it long enough youl look at the clock and see its 2 AM. But really, who cares if they make a lot of them? They all are pretty good quality for me. I totally agree - when I was in the midst of my A Wonderful Life addiction I once saw 4am before I switched the console off! My frustration (and the game's low score) is a reaction to the fact that very little - if anything - has been done to fix some of the problems that have existed in Harvest Moon games for years. As I've said, the European version runs nearly 20% slower than the NTSC version, which exacerbates its problems. Since I've finished my review I'm enjoying it more, but really there are just too many problems here to justify dropping £40 on it, and something needs to be done to stop the HM rot, in my eyes. I think I'd rather get Rune Factory Frontier. Yuck, the worst game of all time. My sister got this in the post in November '09. Ugh, I can't stand with the repetitive tunes, imo. But this shouldn't of got a 3/10 or a 2/10 score, in my humble opinion. Overall, I don't recommend this to anybody. Yes, it's really that bad and it's not really worth it. Think about the next Nintendo title that you are REALLY waiting for - Mario, Zelda, Metroid, Pikmin, StarFox, etc., all other Nintendo titles. Like Taya, I feel this review is strongly unjust. Many long time players of the Harvest Moon series (including myself) adore this game and knocking off 5 points due to a few disappointing factors, some being debatable, is criminal. The two (and only two) things I have negative to say is about the music/character voice and the loading times. While the tunes in this game are lovely to begin with, they can become repetitive - I'll give the review credit for that. And your players voice does indeed sound amateur and could have been done so much better. Loading screens take a couple of seconds (the longest usually being your home district) but it isn't unbearable. Same applies with the PAL issue - as an owner of this version, I can't say the speed rate bothers me much at all. What you never had (the faster version) you'll never miss, is my thinking. Everything else is questionable and varies from person to person. Complaining of the chores that would be naturally expected of a farmer might mean farming simulations (or this particular series) aren't for you. Natsume has given players a break in that crop care isn't as strict as before. If you feel lazy or just prefer to play more casually, crops can be left mostly untended at the cost of a slower growth rate. This is not only helpful to different playing styles but more realistic. Animals need a lot of hearts to produce quality goods, but depending on what you do with them, you don't always need to bother acquiring them. As for the game play and currency system, I love it fine the way it is. It's only traditional to the series that life begins financially and physically tough - I enjoy that aspect. Side chores such as mining, fishing and cooking are all nicely detailed and enjoyable. You'll probably end up favouring one over the rest, depending on your style. The graphics and residents of the game couldn't have been done better, in my opinion. I really enjoyed exploring the vastness of the island when I started and unlocking the hidden regions made the experience even more pleasurable and long lasting. Residents are unique in themselves and you have a fair number of choices for your spouse-to-be. All in all, I give this game a high 7/10. Considering the average among user reviews is often an 8/10 (variable from site to site), I find the one given here somewhat misleading. I have played all the HM's back to the Super Nintendo version and liked them all but I have to admit my fav was the one for PS: Back to Nature. Why? Because in that game you could hire the sprites to do your farm work for you and that freed you up to fish and work the mines more, and they worked cheap (bag of flour or an egg). Beats me why they never did it in a game again. Milking, shearing, watering and feeding animals all get very old very fast. My only other gripe has always been the shortness of the 24 hour clock. It always seemed silly to me to take so long just to ride your horse from one end of the property to another, for instance. I really wish they would revamp the game next time around. This is just too harsh, I found this entry to be just fine even though Animal Parade improved on pretty much everything this one offered.